I’ve come a long way since then; now I actually love Sunday morning worship. But in daily life the language of praise still doesn’t come to me naturally. When I’m discouraged, I become that croaking 18-year-old all over again. Worry and complaints come to mind more easily than praise. Pretty soon bitterness creeps in. Then fear knocks at the door, and I’m done for. I forget all about God’s goodness. A few words of #praise to God can turn around a tide of negative thoughts. When you don’t feel like praising God, look up. 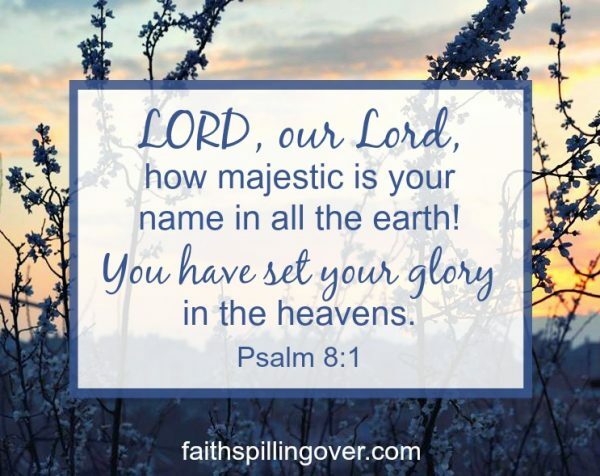 We need to lift our eyes and look at the glory God has set in the heavens. Take a moment to look at the sky above you and consider the greatness of God. Whether you see His glory in a black sky littered with stars or a blue canvas spotted with clouds, it’s hard to look at the sky without remembering that God is greater and higher than we are. When you can’t find words, look to the Word. 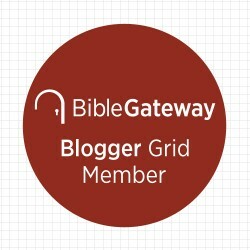 We find words of worship throughout Scripture, but the Psalms are full of them. Sometimes just repeating a phrase from Scripture can turn our minds away from problems and towards praise. As we praise, God establishes a stronghold, which strengthens us against Satan’s attack. We have an enemy who will do anything to attack our faith, and we’re especially vulnerable when we’re discouraged. Praising God for His greatness, love, and power builds our faith. When we’re discouraged, the enemy whispers lies like these: “Will God really provide for my needs?” “Does He really care?” “Is He even there?” Praise silences the lies of the enemy and replaces them with the truth that God does love and care for His people. Praise honors God and gives us the gift of renewed perspective. 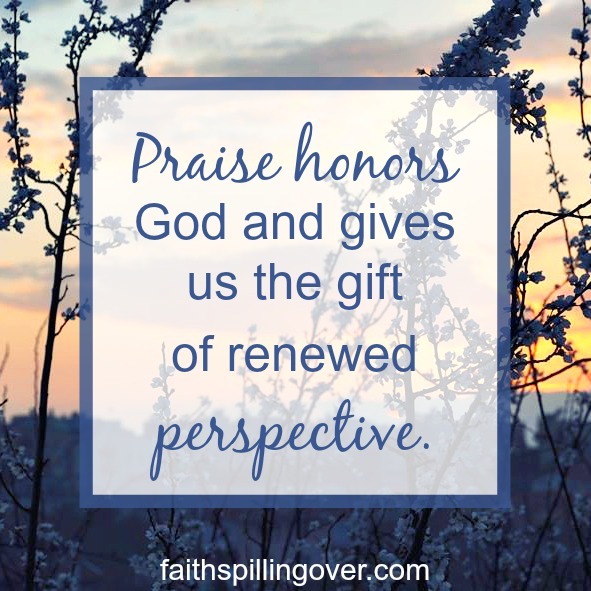 Praise honors God and gives us the gift of renewed #perspective. Praise is a gift we give to God because He is worthy, and it’s a gift God gives to us to renew our perspective. When we magnify God instead of our problems, we see that He is greater. He responds by opening a door to more peace and joy. What is your favorite verse that praises God in Scripture? How about repeating it today? 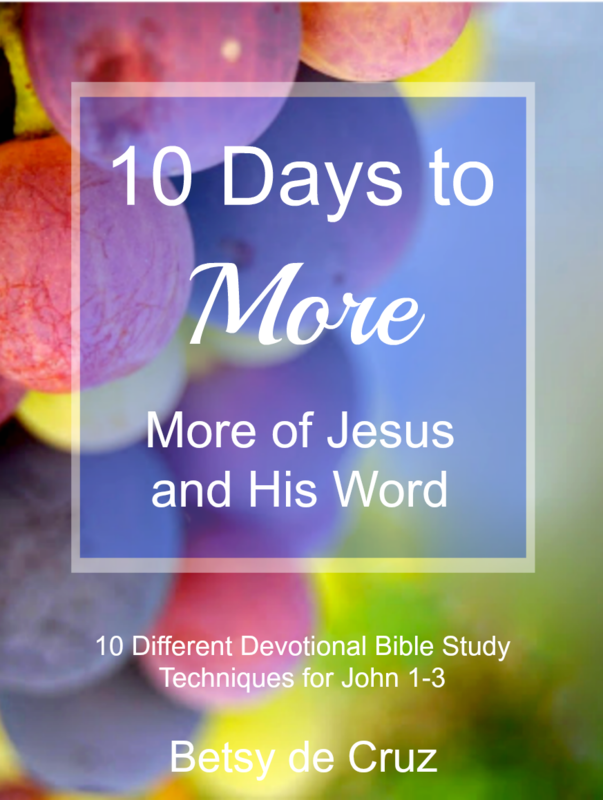 Note: If you would like to receive a free printable with prayers of praise from Scripture, subscribe to my blog before Saturday, November 3rd. 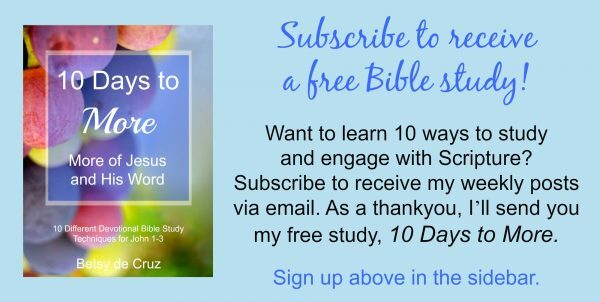 You’ll receive my monthly subscriber newsletter with the “Words of Praise” freebie. Thanks for the reminder to look up…. Aw, Bev. Your comment means so much to me because I have that same philosophy, but I call it “going back to the simple things.” Like “The Lord is my Shepherd.” I love that Isaiah scripture. It is one of my favorites. Love to you. I miss you and look forward to stopping by your blog soon! I grew up singing and am a singer by default, but I still lean hard on the psalms when it comes to praising God in my every day life. The words that come to me naturally just don’t seem to do Him justice, and my heart is divided and distracted. Thanks for your story about your 18 year old self. Those of us who have been doing church for a long time need to be reminded of just how counter-cultural it is to belt out praise songs in a group! Yes, it’s true! We don’t realize how “weird” it can look to people coming in! I appreciate your point of view always, Michele. I can sure relate to having a distracted heart. Praise can be hard. With all the things we face and all that we think about ourselves it can feel silly or unnecessary. But I, like you, have found that it can change so many things. I use praise music to change the atmosphere in my home (and my heart). I don’t always sing along, but something about the praise to God changes things! Yes! I was just talking about that with a friend, Rebecca, how the atmosphere somehow changes at home when we put the praise music on! Spot-on, Betsy. While in Hawaii, I recall a particularly heavy day. As I walked upstairs, and oddly while looking at family photos on the wall, I sensed His Holy Spirit counseling, “Put on the garment of praise for the spirit of heaviness.” I’ll be honest, knowing the words and doing them didn’t connect well at the time, but their message is reinforced immensely with your post today. Thank you, friend. Wow, that is a sweet little story, Kristi. The garment of praise. Jesus came to give us that garment of praise instead of a spirit of despair. but sometimes praise feels “unnatural,” or we can feel like we’re just going through the motions. Still, I find it lifts me up every time. Such good solid truth in your post. Thank you! Lately, I remind myself of Lamentations 3:21-26. And looking up is great advice 🙂 Blessings to you. I was so happy to hear that Pastor Brunson was able to return safely to his family in NC. Praise and gratitude are always the answer when we are feeling discouraged or frustrated. God shows up when we say “thank you” because in the process we turn our eyes back on Him. It’s so good to see you at #tellHisStory again. Blessings sweet friend! Amen! I always feel at least a BIT encouraged when I start giving thanks! I’m always amazed how gratitude and praise turns things upside down and inside out. My attitude and perspective shift from being self-obsessed to Christ-focused. Everything begins to pale in comparison to all He is and all He has done. Christ-focused instead of self-obsessed. So good, Linda! Yes! I find it impossible to look at the sky and not think about how might our Lord is. 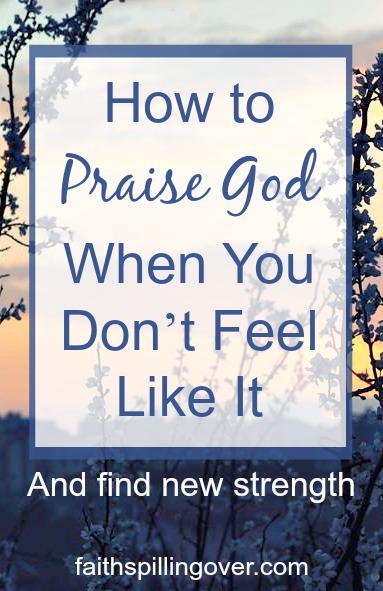 All of these are great reminders and tips on what to do when we don’t feel like praise. In my last post, I wrote about cultivating thankfulness year-round and I touched on how we are to renew our minds (Ephesians 4:23, Romans 12:2) and to focus on what is worthy of praise (Philippians 4:8). This is exactly what you are speaking about as well. Thank you for this! Thanks so much for stopping by. 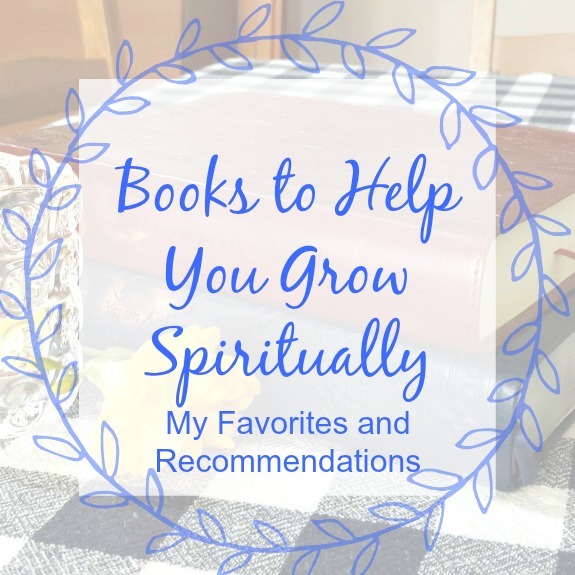 Yes, those are great scriptures to help us focus our minds on what is helpful and cultivates gratitude, contentment, and joy!